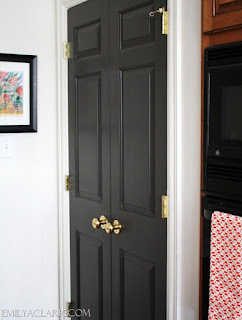 While painting my interior doors black, I wanted to do something different with my door knobs. They were 1970's antique brass. I have search blogs about refinishing door knobs instead of replacing which can be pricey to say the least. I have 26 doors to paint and at approximately $25 per knob, this would be almost $700. Ugly isn't it. I know many of you have these. You are like me, you bought your home for the details and large rooms that are common in the 70's home. She used Rustoleum Pure Gold spray paint. And since brass and gold are coming back in I thought this may be a good choice. These are real interior designers who are using brass knobs. So I decided that I would paint mine like Emily Hewitt. I first started by soaking them in straight ammonia. This made the outer shellac easy to remove. I rinsed them well and started with a Brillo pad. I had to remove old paint from the edges where the doors had been painted by a lazy painter who had not removed the knobs and got paint around the edges (I have many issues with this same painter in other areas of the house). Then I started to sand them with a spongy sanding block I got from Home Depot to prepare for the spray paint. I did find that they sanded much easier when sanding with the sponge block and knob wet. I couldn't believe my eyes. The knobs are solid brass and the look was GEORGEOUS!!!!! This is the before and after. I left a little of the antiquing in the grooves. Then I changed my plans and decided to just spray with clear gloss. Here is the pictures with the knobs replaced on the doors. I can't wait to continue on the other doors of the house. BTW, when we added the upstairs, the builder but the shiny brass plated knobs. I am looking to buy more of the 70's antique brass knobs. If you have any you want to get rid of or sale, let me know. This is fabulous blog presentation. Thanks for suggestions for home decorations.